4:25 - What are the logistics of running a Major? 7:44 - How do you actually get a Valve Major, anyway? 9:59 - What will make the FACEIT London Major special? 13:43 - What was it like in Boston when C9 won the ELEAGUE Major? 19:32 - Do you prepare your signature calls/phrases before you go on air? 30:26 - Do FACEIT and ECS still use the coaching ban rule? 49:07 - Is there a lack of diversity in esports broadcast talent? 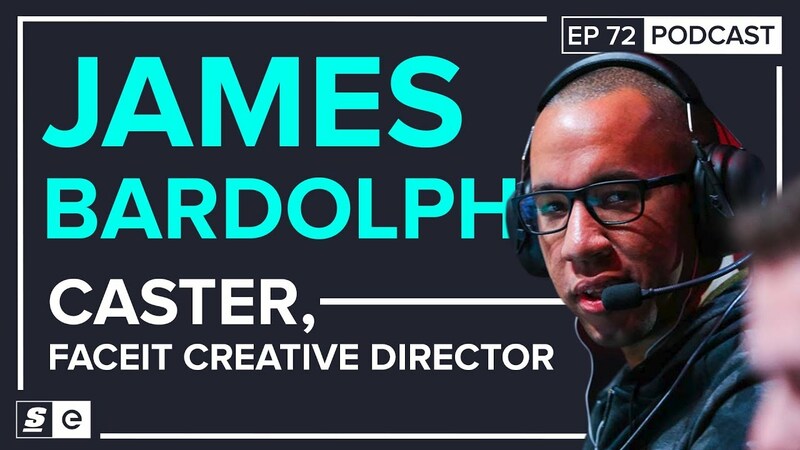 James Bardolph is one of the most recognizable broadcast talents in CS:GO and the voice of some of the game's more iconic moments. When he's not casting Major grand finals, he serves as the Creative Director of FACEIT. Bardolph recently sat down with theScore esports Podcast to discuss what it takes to earn and host a Valve Major, hiring Matt "Sadokist" Trivett after his hiatus from broadcasting and his experience working the ELEAGUE Boston Major. FACEIT will be hosting the next CS:GO Major this September in London, UK. While most of us have to be content with official announcements after decisions are made, Bardolph was able to provide some insight into how and why Majors are handed out to certain tournament organizers over others. "Valve will tender for pitches essentially for people who want to do Majors," he said. "So various companies, PGL, ESL and whoever else, will put a presentation together ... and say 'we would like to host the Major. This is the location, this is the stadium or arena or whatever we want to host it in.' I suppose the key points, you could lay out how you want to do the Minors — if they're going to be by third parties or if you're going to do them yourself, how the players are going to be treated and whatever other requirements they might have." Factors than can earn a TO a Valve Major include unique production gimmicks that can set one event apart from another, and having contingency plans for any unexpected production problems. "I think there was a big period of time, especially with all the stuff that PGL was putting out periodically, it was like 'OK we need to do this gimmick to stand a chance,' which we didn't particularly lean towards ourselves," Bardolph told theScore esports. "But I'm sure each presentation or most presentations would have this particular gimmick — ' this going to be the thing that makes it stand out from all the others and blah blah blah.'" For other organizations looking to make their pitch to Valve, he did offer some advice. The most import thing to highlight, he said, is the location. "You want it to be a good venue. It needs to be a good location, an accessible location both for national and international people and you need to have a good idea as to hotel availability and proximity and you need to be able to be ready to give guidance," he said. "You need to ask yourself what is going to make your event special, prestigious in the line of history, what is going to add to the heritage of what already exists. From that point of view player treatment is important, fail-safes are important as well. Contingency plans, worst-case scenarios. Once you have a presentation you should look at everything that can potentially be a disaster and have a plan in place." CS:GO caster Matthew "Sadokist" Trivett recently took a hiatus from professional casting following a well publicized incident on his personal stream. He eventually returned to the world of commentary after about six weeks for ECS Season Five Finals, which are organized by FACEIT. I am the one who hired him. Problem? He shed some light on the decision and the thinking that went into it from FACEIT's perspective. "I know Matt so I have a better understanding of what he is doing than some other people so I don't know if I can say from a neutral position what it would look like ... we're all in the public eye and we all compete with each other and I think that we all understand that we are personalities ... and we need to have personality. I'm not saying that what he did is good or bad. Obviously it was pretty stupid but I think he's just trying to be edgy. Obviously he didn't take the right path of doing that but he's not trying to be malicious. He is not a malicious person ... I think I'm of sound mind and I think I made a fair decision." While the company he works for is hosting the next Major, Bardolph himself was in the casting booth for the grand finals of the last one. He spoke to theScore esports about what it was like providing the soundtrack to Cloud9's historic Major victory in Boston. "It was a unique challenge in that obviously a lot of people won't really pay attention to the layers of commentary or a scenario of finals for example," he said. "From our point of view, our job is to commentate the finals, our job is to keep it exciting but our job is also to keep the crowd engaged in what is going on ... and the players need to feed off that atmosphere and not just the people at home. It was very unusual because the crowd was extremely biased towards Cloud9, which is the fine — and that's not unusual, the bias was not unusual — but just how far to one side it was was hilarious, to the point where even when GuardiaN's wife and rain's girlfriend came on the camera they were being booed. It was very wrestling, and I love wrestling so I'm all about that but, what was a challenge was if Cloud9 did something and it was very easy to play off the crowd ... sometimes Cloud9 would get close to doing something and then FaZe would stop them and that's one thing so you can hear the disappointment and 'oh my God it was so close', but if there's a round where say FaZe just dominate and wipe them out then the crowd are just dead. It was like a Japanese MMA crowd."